Pretend play is an important part of child development and dressing up as another person or a favorite story character is a fun way for kids to act out their own unique stories. Dressing up in grandma's hat, choosing outfits for a Cyber doll online, or cutting out paper dolls are all good ways to entertain kids. Dress up games online also help promote creativity. Tech-savvy kids can play virtual dress-up games on a computer, phone, or tablet that feature their favorite characters and an endless supply of clothing and accessories. Most online children's dress up games require Adobe Flash Player. DressUpGames has been around for over 20 years and features unique dress-up games and popular ones from around the Internet. Their extensive collection of games includes those for dressing people, decorating rooms and designing houses. Search by category or by what's most popular with users. Kids of any age can play with the only downfalls being that you can't play in full screen and there are ads along the side that younger kids might accidentally click on. Despite the website name, DressUpGirl.net features tons of categorized dress-up games including "boy dress up," "couple dress up," and games that aren't dress-up games at all. There are thousands of dress-up games to choose from and the advertisements are shown below the game screen so kids won't accidentally click on them. The major downfall of this website is that there's no way to search games, so you just have to browse and pick what looks fun. Younger kids will love the small selection of character dress-up games at PBS Kids. Children can dress their favorite characters from shows like Sesame Street, Wild Kratts, and Arthur for a variety of situations and seasons. These games are perfect for toddlers and preschool kids because there are no ads or links they can accidentally click on and they feature simple computer skills like one-click mouse skills. At Barbie.com you can choose from seven different fashion games featuring the blonde character and some of her friends. Each game is fairly simple to play using one-click or click and drag mouse skills. Choose a simple game where you just dress Barbie or pick a longer one where you dress her and several friends then put them together into one picture. Kids using a tablet or phone to play can ask an adult to help them download the Barbie Fashion Closet or Barbie Magical Fashion dress-up apps. If you've got a little one who loves princesses, the Disney Princess Dress-Up game is for you. This super simple game lets kids choose one of five popular princess characters from a Disney movie: Cinderella, Ariel, Belle, Tiana, or Rapunzel. Kids then get to change the background, choose from a variety of dress colors and styles, add accessories and insert fun stickers. Kids who want to dress an anime character can try the Anime Boys Dress-Up Game on Rinmaru Games. The moody background music fits the game theme made for older kids. Two anime boy characters stand side-by-side and kids get to choose everything from skin color to wardrobe for each guy by simply clicking on the options on the right side of the screen. Kids can choose to express their creativity in many ways with dress-up games, activities, and free play. Traditional dress-up involves dressing in clothing and costumes to pretend to be another person, animal, or character. For example, a little girl may put on a princess dress, tiara, and Mom's pearls to have a tea party with her dolls and stuffed animals. Fill a bin with old Halloween costumes or your clothing and accessories so kids can use their imagination to create characters at any time. For role playing, kids wear a costume to become a character for a specific game. There are role-playing games for young children, teens, and adults. Examples of role-playing games that may include some form of costume are Magic: The Gathering or Dungeons and Dragons. Dressing toys helps kids visualize the stories they make up with their favorite playthings. Putting outfits on dolls and stuffed animals is fun, not to mention that it strengthens the bond the child has with the toy. 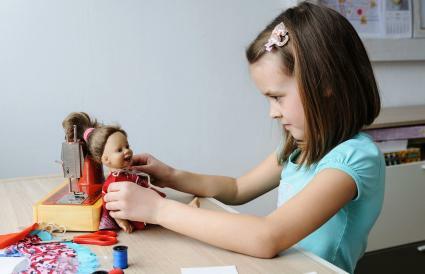 You can find toys and fashion dolls made for dress-up play that come with a variety of outfits or purchase/sew different outfits for a particular toy. Outfitting paper dolls in different clothes is fun pretend play where characters appear to walk straight out of books. If your budget is small, you can print out paper dolls with clothing to use. Most of these games are for preschool and elementary school age children and feature popular cartoon characters and cute animals. There are also some fashion designer type dress-up games for older children and teens. The process of selecting various outfits and accessories and placing them on toys, Cyber characters, or paper dolls can teach kids to identify colors and shapes, as well as develop their motor skills. 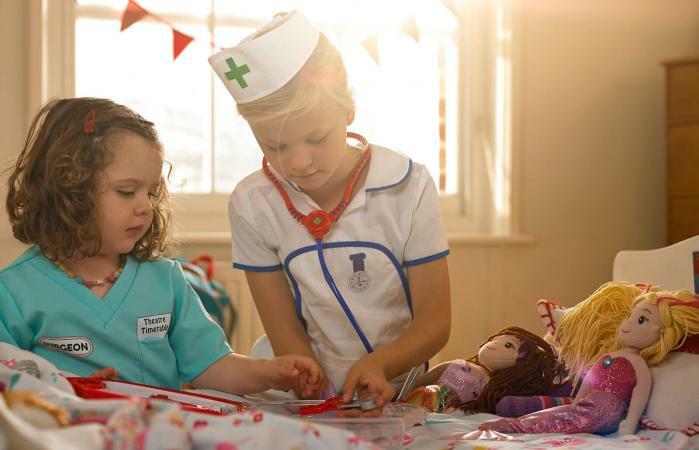 Putting on a costume can also help a child learn to dress herself and deal with buttons, zippers, and tying shoelaces. Outfitting a toy for a tea party can also help a child become more aware of how different social situations call for dressier clothes and provide a chance to practice how to set a table and learn about manners and etiquette. Dressing games can also be great family activities kids and adults can enjoy together. 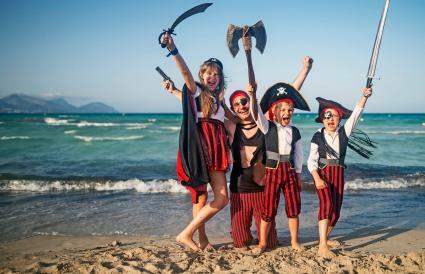 Mom, Dad, and the kids (or whoever lives in the house) can all dress up like pirates for a special scavenger hunt. Create clues that all have a pirate theme and hide small treasures so everyone gets some type of treat. The treasure hunt can be pulled together quickly without much planning using candy or Dollar Store items for the prizes and creating clues that relate to the family members. Sit down with your child and create little characters out of Play-Doh. Use different colors of the molding compound to personalize the characters with clothing and accessories like bow ties and necklaces. The versatile clay and available tools allow many creative possibilities for funny characters and outfits. Have the entire family dress up in costumes and hold a costume contest. Create one or two winning categories and give a prize to the winners. Tailor the amount of winners and prizes depending on the size of the family and contest participants. Remember Mr. Potato Head? Make a version from scratch to personalize. Take a clean potato and create eyes, a nose, a mouth, and limbs with objects commonly found around the house. For example, use two loose buttons for the eyes, a tack for the nose, yarn shaped into a smile for the mouth, and four twigs for the limbs. Make clothes with cloth or even construction paper. Create accessories like pipe cleaner glasses or a construction paper hat. Kids will have fun helping figure out what to use for the outfits and putting them together. Today's dress-up games are not limited to rummaging through Grandma's keepsake boxes in the attic or dressing up dolls or stuffed animals. It is a whole world of computer games and role playing that kids from preschool through the teen years all enjoy.